Westside AFC will fly the flag for LEAFA in the quarter-finals of the RJM Sports Sunday Trophy after they knocked out Falkirk based Carron Valley 3-1 to reach the last eight for the second year in a row. Home side Westside were in the ascendancy in the early stages but fell behind against the run of play after 20 minutes. Premier Division Westside soon equalised, however, as Eddie Mearns went in a terrific cross for Scott Thomson who rose highest to head the ball into the back of the net. 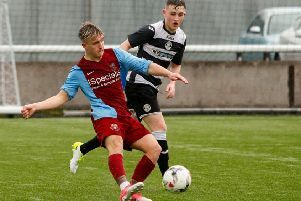 Former Tynecastle youngster Scott Coleman put Westside ahead in the tie when he fired in from the edge of the box, but Westside had to rely on goalkeeper Scott Walker to preserve their lead as he saved a penalty kick. Mearns then gave Westside some breathing space as he scored the third to secure a place in the next round. Meadowbank Wednesday, Edinburgh East, and Wallyford Bluebell all saw their Scottish Cup dream ended as they were all beaten in 90 minutes. Edinburgh Harps came from behind to maintain their Lothian West title challenge with a 2-1 victory at Queensferry Athletic. Second place Harps remain five points behind league leaders Murieston United B who were 4-2 winners at Linlithgow Rose in one of few LEAFA Saturday matches to beat the big freeze. Harps had to dig deep to secure all three points at South Queensferry Sports Complex after going behind midway through the first half. Craig Lamb had come close for visitors Harps when one-on-one but they found themselves a goal behind when Queensferry’s Angus Brock raced on to a defence-splitting pass and fired past Ross Burns. Scott Gardener came close to a leveller from a header as Harps fought back in search of a leveller, which would arrive ten minutes before the interval. Jonny Cosgrove’s corner-kick wasn’t dealt with by the home defence and club veteran John McClarey capitalised as he lifted the ball over the Queensferry goalkeeper from a tight angle. With their tails up, the visitors would produce the winner 15 minutes from time as man-of-the-match Cosgrove went for power from a free-kick and found the back of the net. Harps switched formation and defended doggedly to preserve their lead. Meadowbank knocked out Championship league rivals Newcraighall Leith Vics 5-1 in the Logan Cup third round at Portobello 4G to set up a quarter final against Heriot-Watt. Paul Martin hit a hat-trick and Ross Stenhouse netted a brace as the Championship league leaders dominated, with Vics netting a late consolation.